For school-specific demographics, visit our equity page or the Virginia School Quality Profiles. For teacher and staff demographics, visit our equity page (under “Classroom,” click “Partnerships to Recruit/Support a Diverse Staff”). 11 CHS seniors were recognized as semi-finalists or received letters of commendation from the National Merit Scholarship Corporation. 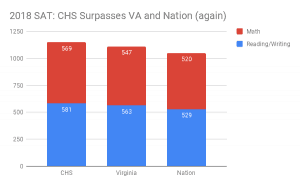 CHS continues to surpass state and national SAT scores. (see chart, right). According to 2018 College Board data, in reading/writing, CHS earned a score of 581; the state, 563; and the US, 529 . In math, the scores were CHS, 569; Virginia, 547; and US, 520. CHS offers more than 30 college-level courses (Advanced Placement and Dual Enrollment). 67% of the AP exams taken by CHS students earned scores of 3 or higher, with 41% earning 4s and 5s. More than one third of our high school students take at least one exam. We offer preschool programs for eligible 3- and 4-year-olds to get all our students off to the right start in school. All elementary students in grades K-4 take art, music, and Spanish (grades 1-5). Our schools take advantage of the rich cultural resources in Charlottesville, including the University of Virginia, Monticello, the Paramount Theater, the Charlottesville and Richmond Ballets, and much, much more. Students can choose to earn a college associate’s degree while at Charlottesville High School– and other AP and dual enrollment opportunities abound. Developed in collaboration with UVA and the Smithsonian Institution, a ground-breaking engineering curriculum has been developed at Buford Middle School and other area schools. The Charlottesville High School Sigma Lab opened in 2014. Walker, Buford, and CHS have more than 90 clubs and activities. CLASS afterschool programs are open to all elementary students.